The reservations and loyalty program systems, official sites, and the mobile software application program of Marriott Rewards will be offline for several hours intermittently through Sunday, August 19, 2018 effective as of tomorrow, Wednesday, August 15, 2018 — meaning that you are advised to manage your accounts and reservations prior to the start of the temporary planned disruptions. The disruptions are the result of the work to combine the Starwood Preferred Guest and The Ritz-Carlton Rewards frequent guest loyalty programs into Marriott Rewards, which is expected to become effective as of Saturday, August 18, 2018. Starting this month, Marriott Rewards points will follow a new earning and redemption structure. Although technically more hotel properties are moving down in redemption rate categories than up, this is after what many people consider to be a massive devaluation effective as of Monday, March 5, 2018 in which — out of a total of 1,329 hotel and resort properties which were affected by the changes — 1,082 of them increased by at least one category; while 247 of them decreased by at least one category. 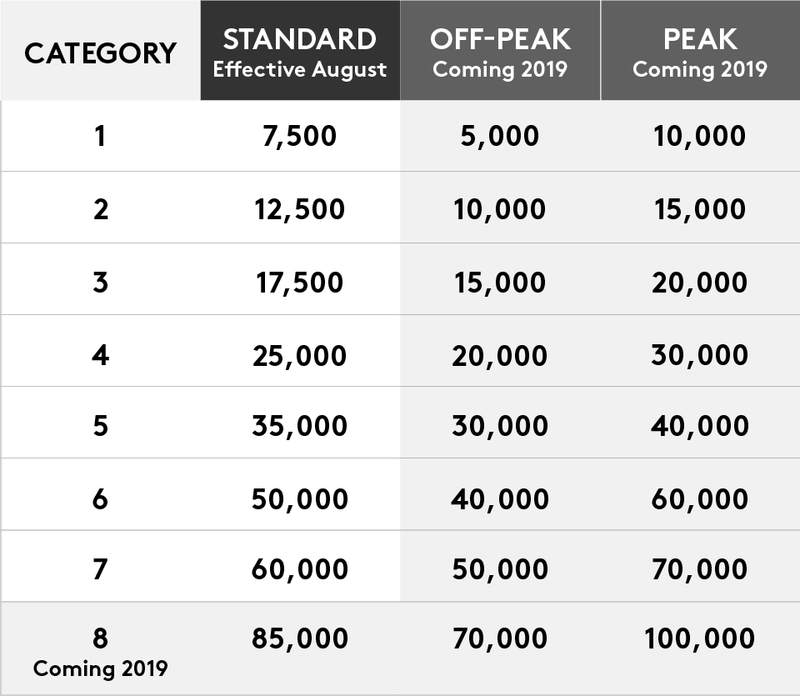 You can book award reservations at standard redemption rates for Category 1–7 hotel and resort properties; while you can save up to 25,000 Marriott Rewards points per night when you book future Category 8 hotels at the Category 7 rate until that new category is introduced sometime in 2019. The good news is that none of the approximately 6,500 participating hotel and resort properties will have blackout dates pertaining to redeeming points for award stays. If you have not already been contacted by Marriott Rewards via e-mail message or other method, then this article is a short notice for you to be aware of potential disruptions over the next four days; and if you need to manage your membership account or access upcoming reservations, you are advised to please do so as soon as possible. Friday, November 16, 2018 will be three years since news of the acquisition of Starwood Hotels & Resorts Worldwide by Marriott International, Incorporated was announced — and the consolidation will still not be fully completed until the new Category 8 is official added to the reward nights chart; and a new name will be announced for the consolidated frequent guest loyalty program of Marriott International, Incorporated. And when I attempt to recover my password with the “Forgot Password” link, I’m told my information does not match the account information. I’m set to make Platinum after a current stay at a Marriott property that ends this Friday, so this has me understandably concerned. Further the site has been “down” for approaching 12 hours now.